Sounds like Teen Spirit is a look at all the times when a song has sounded like another. Often this is just coincidence, with songs having the same feel, rhythm or the odd beat in common. Other times, it is quite clear the other band stole or plagiarised from the other artist. What this book does is break down all the times when this happened and what the outcomes of legal action has been. 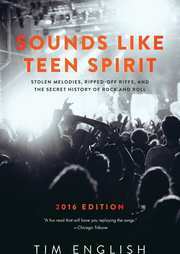 With the current court case with Led Zeppelin's infamous Stairway from Heaven sounding ever so suspiciously like the song Taurus by the band Spirit this book contains a whole section dedicated to Zeppelin being 'inspired' or 'stealing' from others. A number of bands also have sections dedicated to them including The Beatles, The Rolling Stones, Bob Dylan and others. Two of the most prominent songs discussed are Robin Thicke's Blurred Lines sounding like Marvin Gaye's Got To Give It Up and Coldplay's Vida La Vida and If I Could Fly by Joe Satriani. Listening to these songs, you can say there is no doubt about it that the songs were stolen. A lot of the claims are a little spurious and at times you have to question why they are included. Does Radiohead's Creep really sound like The Hollies The Air That I Breathe? No, not really. Yes, it feels the same rhythmically, but nothing else about the songs are the same. Does Dylan's I Wanna Be Your Lover sound like The Beatles' I Want To Be Your Man? No not in the slightest other than the fact they both include the line 'I Wanna Be Your Lover, Baby, I Wanna Be Your Man'. Other than that, the songs are completely different. This would be like saying Patsy Cline's Crazy sounds like Britney Spears song of the same name, or Adele and Lionel Ritchie's Hello. One thing I would say is that this is the very definition of a 'coffee table book'. It's the kind of book you can pick up and dip into for a few chapters and then leave. If you are a fan of certain bands or songs. At over 400 pages there is a wealth of stories and the appendices looking at certain song family trees is pretty interesting too. Here we see how songs like Lady Gaga's Born This Way sounds like Madonna's Express Yourself which also sounds like The Staple Sisters Respect Yourself. It is funny to read how Madonna accused Lady Gaga of being 'inspired' by her, only to see that her song was also inspired by The Staple Sisters. Sounds like Teen Spirit is a great book. If you are a fan of music, then this will be the book for you. Though at times it feels like the connections are a little vague some of them are fascinating and when you hear them back to back you can understand why lawsuits such as the one with Led Zeppelin are so frequent. All I know is I'll never be able to hear some songs, without thinking about another one.